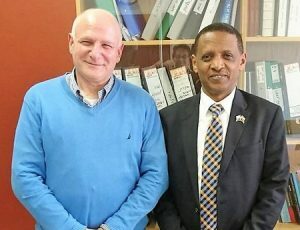 Ethiopian Ambassador His Excellency Mr. Reta Alemu with Prof. Yoram Weiss, Director of Hadassah Medical Center at Ein Kerem. 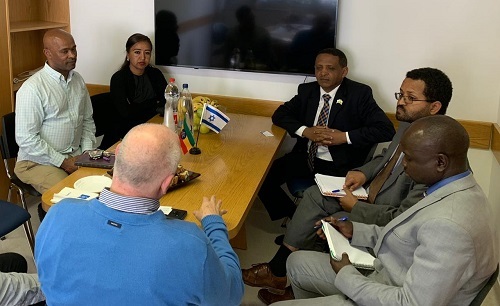 The Ethiopian Ambassador to Israel, His Excellency Mr. Reta Alemu, Ambassador Extraordinary and Plenipotentiary of Ethiopia, along with other diplomats representing Ethiopia, visited the Hadassah Medical Center for the first time to learn about Hadassah and it’s many achievements. 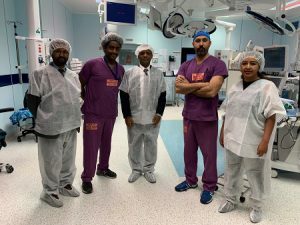 The Ambassador, together with the other members of the delegation, donned surgical scrubs for a visit to see the state-of-the art Operating Rooms at Hadassah. They were also very pleased to have the opportunity to actually meet with an Ethiopian patient. Hadassah surgery staff shows the Ethiopian Delegation one of the Operating Rooms. 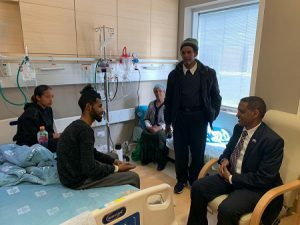 In 2019 Hadassah has embarked on a program to help Ethiopian Hospitals combat infection. In 2018 a team of Hadassah Doctors flew to Ethiopia to perform back surgery on 5 children with severe spinal deformities. In 2017 a Hadassah doctor taught a pediatric emergency medicine course in Addis Ababa. In the late 1990s HIV/AIDS Research and treatment in Ethiopia was initiated by Hadassah’ Prof. Shlomo Ma’ayan after cases of HIV/AIDs were diagnosed in the Ethiopian population that had immigrated to Israel in 1991. Prof. Ma’ayan was studying AIDs and conducting researching looking for new treatments and a possible cure for AIDS. He partnered with the Lion’s Hospital in Addis Ababa to study the strain of the HIV virus that was found in the Ethiopian population. Hadassah Luxembourg supported this research under a program of the Luxembourg government to match every Euro raised by Hadassah Luxembourg two to one. The need for anti-retroviral drugs became obvious, and Ministers from the European Union came to Hadassah to meet with Prof. Ma’ayan and Prof. Dan Engelhard. They agreed to fund anti-retroviral drugs to treat AIDs in Ethiopia until such time as the Ethiopian Government could take over the funding of these life-saving drugs.